Operating from our Swindon base, we provide trailer-based stage hire for outdoor events, concerts and festivals all over the UK and Europe. We offer the latest in stage hire supply, with our fleet of 6 trailer-based stages, specially equipped 4×4 towing vehicles fitted with winches, off road tyres and front mounted towing brackets. All of this means that as a Stage Hire specialist we can manoeuvre our stages into positions other suppliers cannot. All of our Stage Hire equipment and PPE is unbranded which allows us to work as a member of your established production team or just unbranded space for our customers to promote their own Company, Product or Event. Our stage hire staff are all fully product and CITB health and safety trained and all stages come complete with risk assessments, method statements, Eurocode structural calculations, wind loadings and anemometer. Trailer Stage Hire for Festivals. Trailer Stage Hire for Corporate Events. 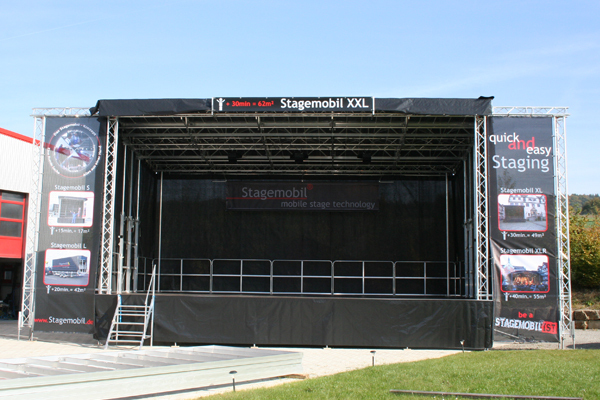 Trailer Stage Hire for Sporting Events. Trailer Stage Hire for Firework Displays. Trailer Stage Hire for Xmas Light Turn Ons. If you are looking for Stage Hire from a Specialist Stage Hire Provider and require the latest in Stage Design for your event why not take a look at our gallery to inspire you! If you are planning an event, concert, festival or even a Christmas lights switch-on contact a member of our experienced team who will help you plan your stage hire requirements. Using trusted industry colleagues we can also supply a complete package to include PA Sound Systems, Lighting Systems and even power requirements too. We’re just an email away!